By 1875, a year after his father’s death, 27 year old Gottlieb Jacob Burrer known as Jakie became the sole owner of the mill. In May 1875 he married Samuel Shriver Gammill’s daughter Amy. Shrive built a house for the couple which still stands across North Street from the mill site at 47 North Columbus Street. It remained in the Burrer family until 2015. 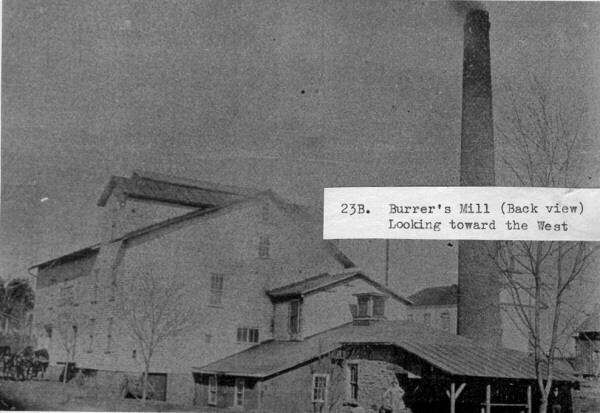 Shrive Gammill kept his promise and built the Burrer Mill at 60 N. Columbus Street. Foundations were laid for a frame structure for the mill and one of stone for the boiler and engine room. Since the new mill was to burn the excess slabs and saw-dust from Gammill’s saw mill and Hoop Factory to fire the new boiler, an exceptionally large and tall smoke stack was erected to permit burning of this fuel with safety in the quantities needed. A steam engine was purchased in Mt. Vernon shipped by train to the trestle over the Big Walnut but the trestle was being replaced from its collapse. The machinery was loaded onto a wagon and pulled by ox to the mill. In the new Sunbury Mill, grain was ground between rotating grooved stones or ‘buhrs’ made in France, cut in segments, shipped to Sunbury, put together with wide bands of thick steel. In 1996 one of these was preserved in the patio of Jakie’s home at 46 N. Columbus Street. Its mate was in custody of R. F. Sherfy who lived near the Big Walnut Creek east of Sunbury. 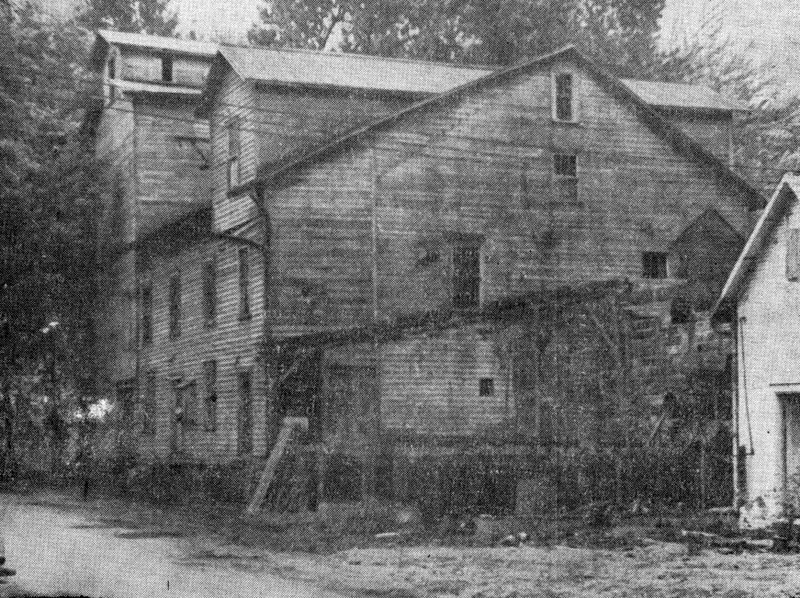 In 1879, Jakie and his wife Amy transferred the deed to the old Burrer (Bailey, Boyd) Mill to Jakie's sister Louisa and her husband Henry Fleckner where it became part of the quarry. Fleckners built their house at 10 Walnut Street where they raised two children. Some of the old stone foundation of the mill can be seen near the creek. In 2016, Dan Schwartz is restoring the house. Jakie and Amy became the parents of 5 boys: Sprague who was named after Jakie’s former partner was born in 1876, Karl in1879, Parker in1886, Rudolph in 1888 and Gordon in 1894. Sunbury Mill flourished. Farmers brought their grain from miles around by wagon or horseback and often had to wait hours for their turn to get the grain. Amy Burrer was not a great cook but she was still expected to feed farmers waiting for their grain to be milled. She served pancakes from flour ground at the mill. When she was stressed or busy whether doing laundry or calling on new people in town, Amy cooked beans. She became known for both but many people remembered her for being frugal. 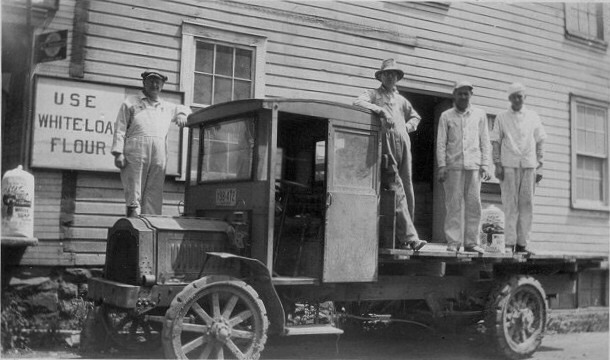 Coal was delivered to houses and businesses and sent down chutes into the basements. Amy timed her walks to follow the deliveries. This gave her the opportunity to pick up coal dropped by the delivery men, put it in her purse and take it home to add to the family’s coal supply. But to Louise Sheets, Aunt Amy Burrer was very special. Each summer Louise came over the corduroy road from Delaware to spend a week visiting her Aunt Amy. Since Amy had only boys, she was delighted to have the little girl. She took Louise shopping which was a special treat because her mother made all her clothes. As an adult, Louise Sheets owned The Little Shoppe which was an upscale dress shop at 14 South Vernon Street north of the Drug Store. She also sold Hummel figurines and prints. 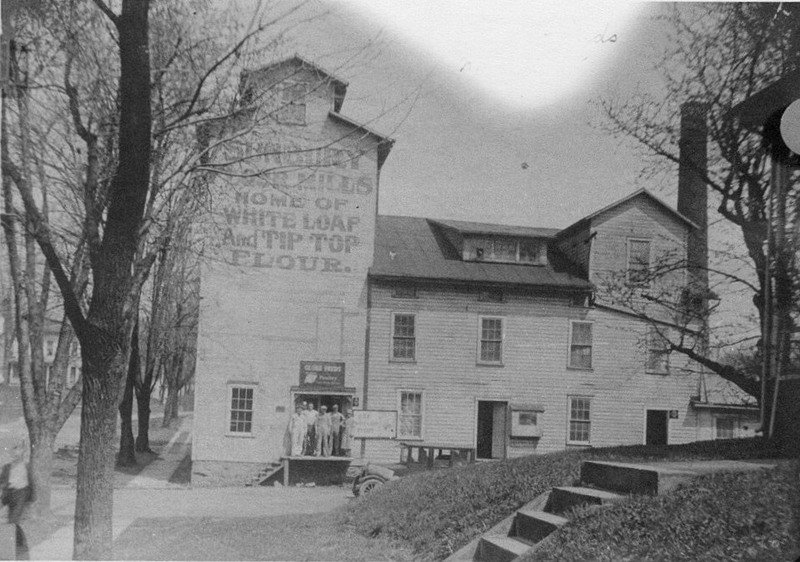 The stone buhrs were replaced with steel rollers in 1886 and the Sunbury Mill was known for its white loaf flour and Red-A-Mix pancake flour. This was shipped locally and overseas. 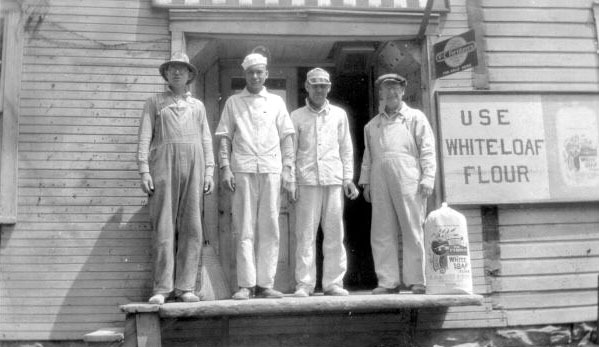 During World War I Herbert Hoover’s Belgium War Relief needed flour so G. J. Burrer and Sons sent White Loaf Flour to Europe in sturdy white linen bags. The bags were stamped with the logo for the mill in bright colors. In Charleroi, Belgium, Alice Gugenmeim’s family had a warehouse of embroidery thread which had been used by the embroidery workers prior to the war. Because of the war there was no material to embroider and the workers were out of business. She could find no bleach to remove the writing on the flour sacks but the fabric was good and strong. Women began enhancing the designs which were used to cover lampshades, waste baskets, tea cozies, pillow covers and even school smocks. The items were sold on a prominent street in Brussels and yielded tens of thousands of gold-standard francs to the Belgium Relief. In appreciation some of the school children embroidered 500 of the bags and sent them to Herbert Hoover. 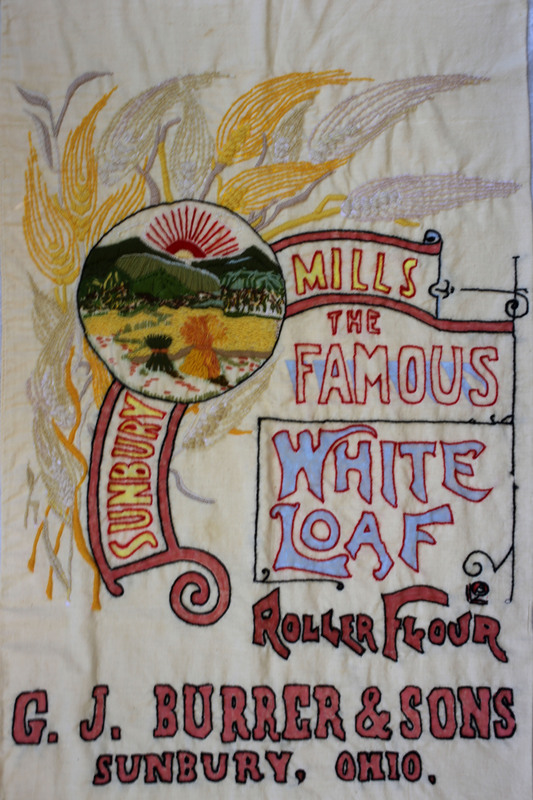 One of the enhanced Sunbury Mill bags was put on display in the Hoover Peace Tower. A replica is in the Community Library files. Electricity for the community became a bi-product of the mill but that's a story for another day. In April 1945 the mill and Sunbury and Condit elevators were sold to the Farm Bureau. Forest Canady bought the Burrer Mill from the Farm Bureau. Hoyt and O.W. Whitney, jr. bought the property in 1951 and tore down the building. The Cream Corner was built on that corner and a commercial building which now houses Ke-Wa-Pa was built on the north part of the lot. Burrer, Dorothy Dillenbeck and Horn, Polly Whitney Brehm. Flashback: A Story of Two Families. Community Library, 1996.